The Budongo Forest Landscape: Balancing competing land uses – One Billion Hungry: Can We Feed the World? Deforestation is thought by both residents and government alike, to have exacerbated poverty, landlessness, changed weather patterns, reduced soil fertility and led to the out migration of once common species. Forests are disappearing quickly in the Budongo Forest Reserve landscape, a trend that is thought to have begun in the 1980s with the growth of sugarcane farming, influxes of migrants and the introduction of pit-sawing, charcoal production and more extensive mechanized farming systems. 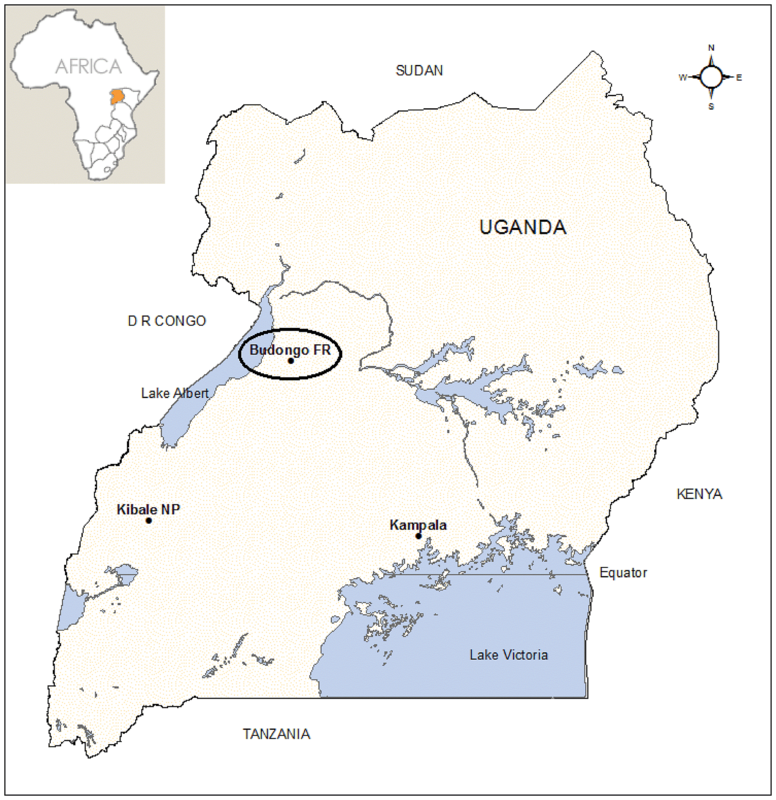 As of 20 10, in the area between Budongo and Bugoma Forest Reserve to the south, approximately 90,000 ha of high forest and 120,000 ha of woodland remain in the landscape outside protected areas, predominantly in small patches of up to several 100ha. 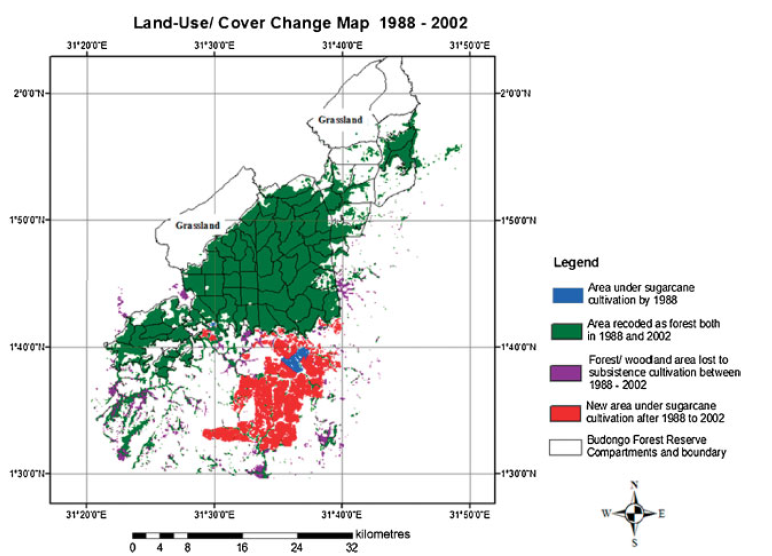 Mwavu & Witkowski (2008) investigated land use change in and around Budongo Forest Reserve between 1988 and 2002. Area under sugarcane expanded 17-fold from 690 hectares (ha) in 1988 to 12,729ha in 2002. The loss of 4,680ha of forest (a reduction of 8.2%) occurred on the southern border of the reserve to allow for sugarcane expansion. This landscape is home to Uganda’s second largest sugarcane estate (Kinyara Sugar Works Ltd), established by the government in the late 1960s. Although production ceased during the reign of Idi Amin, KSWL was formally re-habilitated in 1995 by Booker Tate Ltd, with funding supported by the Ugandan government. Today the Government of Uganda own a 30% share in the company, the majority of the share owned by a private investment group. Within the landscape KSWL have a nuclear estate of around 8,500 hectares and 20,000ha of land is farmed by outgrowers, a scheme began in the 1980s to increase sugar production and reduce rural poverty. Based on past change we might expect the remaining unprotected forest to be cut down and sugarcane farming to expand further. With severe resource shortages including land and firewood, the former looks likely but future deforestation may not necessarily be driven by sugarcane expansion. To date the replacement of forest outside Budongo with sugarcane has been partly driven by a growing domestic market due to population growth (domestic demand is estimated to be growing at 1% per year). While this looks set to continue, KSWL and the other major sugar producers are already exceeding domestic demand, and there is an excess of sugar on the domestic market with Kenya and Tanzania selling sugar to Uganda, Rwanda obtaining sugar from the EU duty free and selling to Uganda, and cheap imports of sugar from Brazil and India increasing in availability. KSWL are also already producing at capacity and, as a result, are no longer taking on new outgrowers. Kinyara do want to continue expanding, however, diversifying into power generation, but they state they want to focus on intensification on existing land as opposed to continued expansion of area. To this end they are pursuing several areas of research such as biofertilizer technology to fix nitrogen, dissolve fixed phosphorus in the soil and make potash in the soil available to plants; use of sugarcane processing by-products as fertilizer; and biological control to reduce the incidence of sugarcane pests. Indeed, KSWL will need to have much more consideration for the surrounding environment if they are to maintain year-round production as climate predictions suggest the landscape is likely to dry out further even without continued forest loss. It’s not just the physical landscape and production levels that are of interest, however, in future posts I’ll be looking at how cash crop expansion and deforestation impact local people, their livelihoods and food security. This is a landscape where yields are poor, support to raise production on subsistence farms is lacking and food shortages are the norm. Low dietary diversity has been identified as a problem in much of the west of Uganda and 42% of children are stunted as a result. I’ll also be exploring the views of people and communities in the landscape and discuss future predictions and possible threats to the landscape’s ability to support a growing population. In areas neighbouring the landscape, for example, considerable amounts of crude oil deposits have recently been discovered leading to speculation over the likely long-term impacts on communities and the environment. Although sugarcane expansion, deforestation, soil exhaustion, resource depletion, hunger and poverty, and now possibly oil exploration make the outlook for this landscape seem bleak, there are people and organisations making a difference and I’ll be looking at the projects trying to improve people’s livelihoods and conserve the forest. Ultimately my research is trying to explore whether there are ways of protecting the remaining environment, increasing agricultural productivity and tackling food insecurity, three objectives of sustainable intensification, so I will end the series with a discussion of the applicability and achievability of such an approach in such a landscape. Again your comments, thoughts, questions are much appreciated. Reblogged this on Sahel Green Food. Thanks for the information in this blog. I am very interested to be in contact on your research, as it matches very well with a programme we’re currently formulating on balancing land uses and preventing further deforestation in Budongo Forest to maintain food security, water and climate resilience. Your information could be very valuable. Looking forward to be in contact!